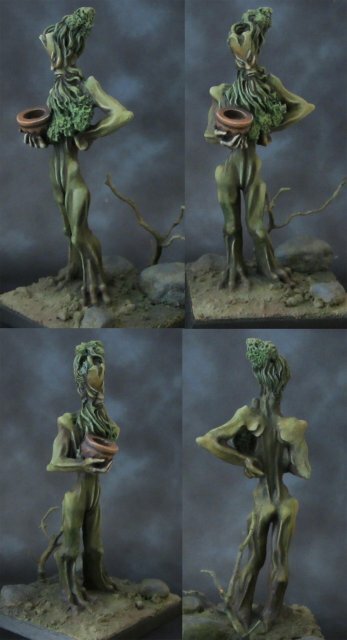 pretty impressive your painted figures WOW! Thank you friends, I don't feel myself lost. Now to introduce myself at Who's Who. 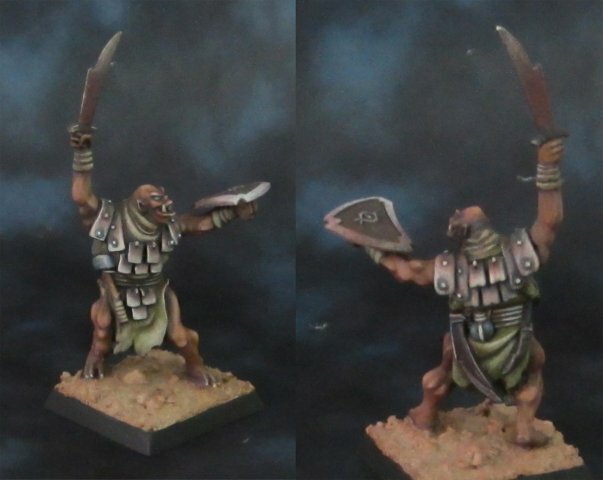 I used for the base in the skin a orange-flesh colour, of the old Citadel range, but I lost long ago the label and don´t know the name (I post a picture of all the colours used). After, I mixed a little of Bubonic brown (a brown with lot of yellow) with the flesh and highlighted. 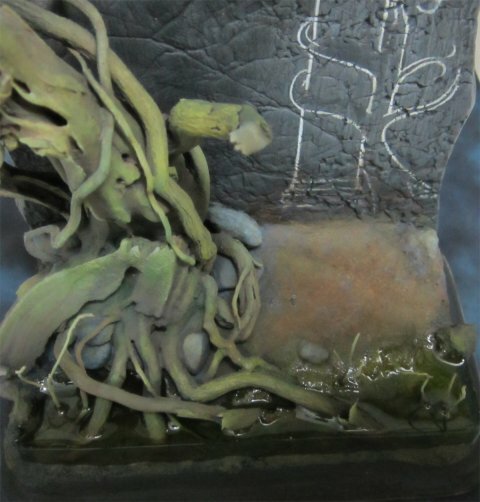 After, I increase the light adding several layers with a mix of flesh-little Bubonic brown-Bleached bone. But I applied them in small zones (shoulders, knees, hands, face, chest…), and leaving most of the skin in the base colour. As always, I apply lot of thin layers in every step (this is, 3-4 layers of the same mix or colour), to get an smooth result. Javier, happy to see you active here. Paint some of your stuff and show us! 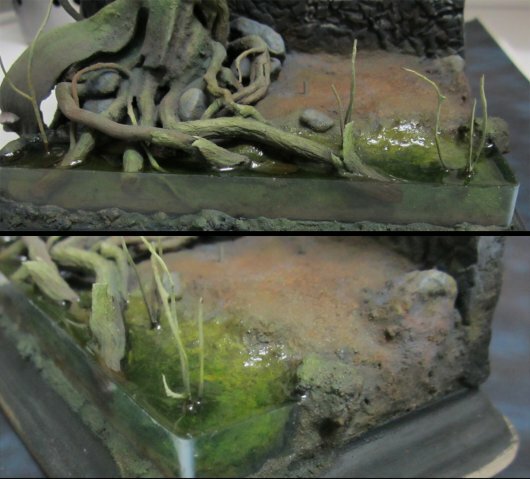 Maybe the technical part in your post could be moved to painting tutorial ? Maybe when I´ll have some different tips and tutorials, I could re-unite them in a unique post. Hi master of Brushes ! I definitely think many of us would be delighted to read your tutorials. 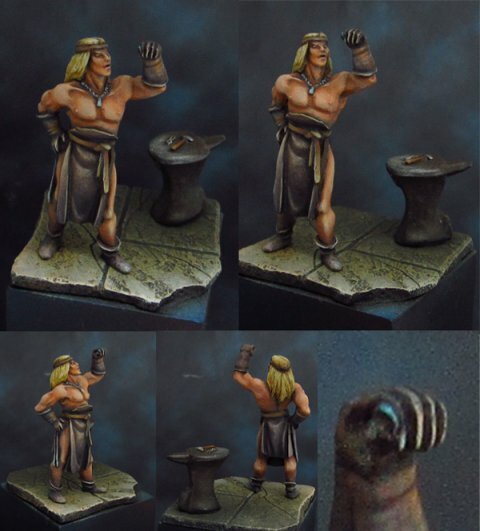 Master Elroi, right now your tutorial example I use for painting one miniature, so we'll see how it will look. Master Thingol, an advice: when using new techniques of painting, or practicing some things you never have done before, try to paint miniatures that you like and avoid that ones you dislike. And my collection keeps growing! And those pictures..... Awesome again! Wow ! 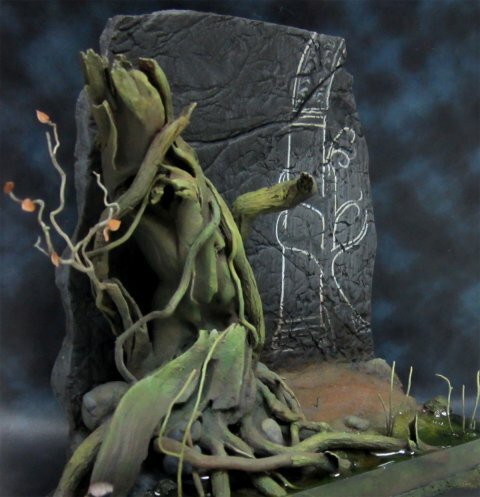 Again Master Elroi shows us how to highlight mithril miniature's finer points. I also suggest you to provide such good work to Michael on Mithril site. Hi all again! Remember me? The seated Goblin king. I repainted this one. A Mordor Uruk. One of my favorite orc. I tried to paint the armour in a different way, far away from my typical metallics. I think looks nice. Lugburz. Big and mean, as every orc should be. 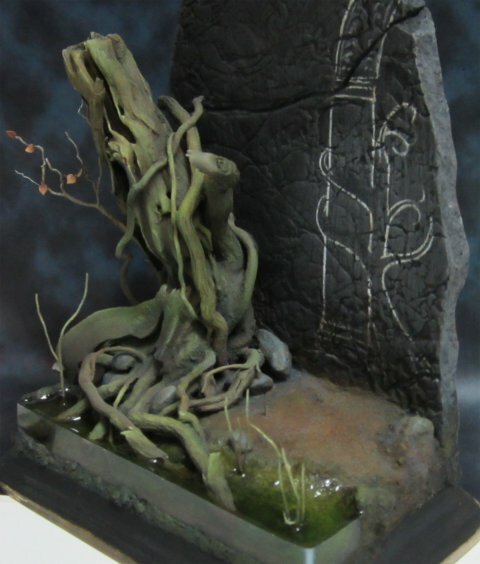 And tomorrow I will post my first proyect of a mithril diorama and I will ask you for some help with it. I am really pleased to see you back here, especially with such tremedous painting work. Welcome back dear friend.... it is great to see your magnificent painting work.... !!! Thanks for this pictures !!!! Thanks for the words and the welcome! 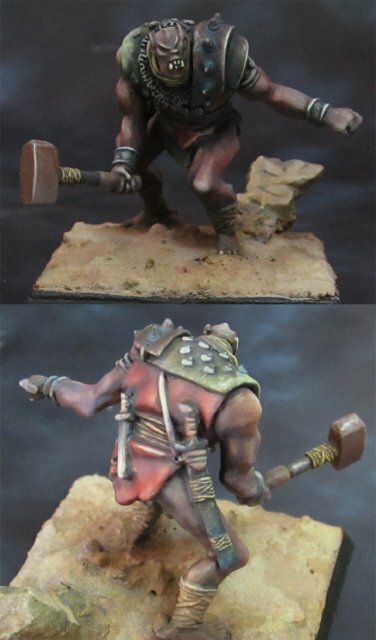 Now I´m starting to do more than simple paintings on my mithril minis… that means scenes and dioramas! This is my first one, the Gates of Moria: not a big scene, but I tried to make it as detailed as I could. And my big problem now is: what miniatures should I use? 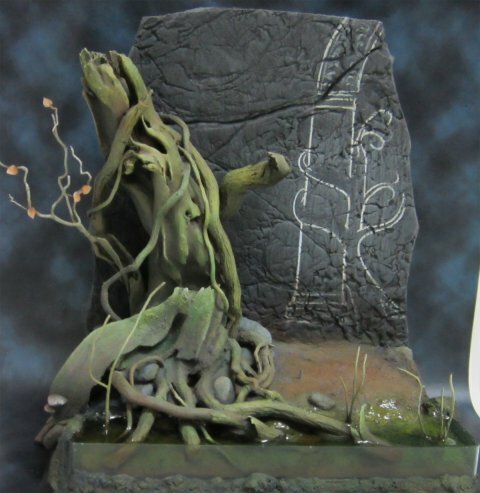 I started with the terrain an tree and water, and almost forget the characters…. 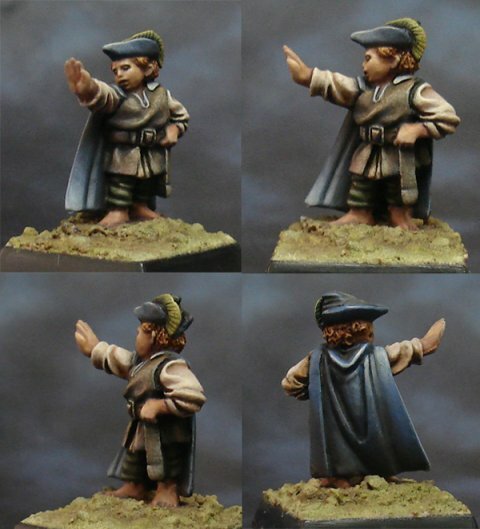 I´d like to represent Gandalf talking with Frodo, but I´m not sure about what miniatures should use. Could you, wise members of this site, help me? Great painting worl like always Master Elroi !!!! First, let me write it looks Great so far ! And I have been thinking about Moria's gate for 20 years ! To my point of view, best gandalf candidate is MS553 as if he was trying to open the gate. I agree M57 is a very good candidate for a travelling hobbit. Terrific work Master Elroi! The pale green robes really work with the brown/red skin you use for orcs. 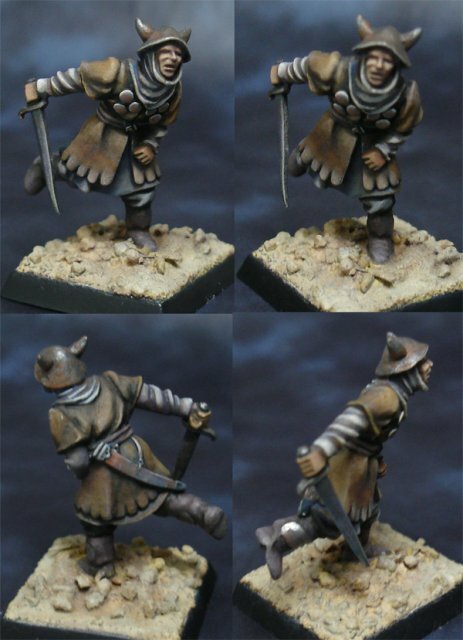 And te sharp highlights on the Hobbits cloaks are a master touch. The Giant is technically quite good also, but too clean for my taste, as if he has just washed his furs for the photo. Also some body hair on his chest, armpits and forearms would suit him nicely in my opinion. For the vignette, I sugest m52 for Gandalf. It seems you were collecting Mithril in the good old days, so you may have it already. I have a spare M52 if needed. First of all, thanks a lot for the kind words and the suggestions. Our 'Tree' should like this one . Another mini-masterpiece. Hi friends! there is another update of my (slowly) growing collection of mithril. An finally, the Moria gate almost finished scene: Gandalf scolding Pippin at the gate. I finally used the M113 Frodo to represent Pippin and now I must find M113 Sam, to put him seated in the roots of the tree, in front of Pippin. Anyway, hope you like them! !